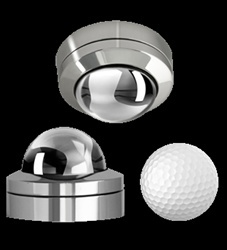 GOST Xtreme Mini Dome Low Light Stainless Steel Camera is a super low light tiny dome camera machined from a solid block of highgrade 316L Stainless Steel hand polished to a mirror finish. The GOST Xtreme Mini Dome can be surface or flush mounted and comes standard with a 3.6mm lens which provides a 90°degree view. It is also available with a 2.45mm wide angle lens which provides a 150° degree view. The Xtreme Mini Dome has been designed for extremely harsh environments for both internal and external use. The Xtreme Mini Dome has passed several controlled experiments by independent bodies to test its strength and has always exceeded expectation. The stainless steel housing is backed by a 15-year warranty with a 3 year warranty on the internal camera which is proof positive that this little camera can stand up to whatever you throw at it, even in the very harshest marine environment. Ideal for Yachts, Commercial Vessels, Oil Rigs or any other Marine, Coastal or other area where extreme conditions exist. On screen display (OSD) Controls to adjust camera settings even reverse the image to make it a back up camera for use when docking the vessel with visibility of the aft deck.